SOT – Security Alarm System EOOD keeps a public vault in the company’s head office at 52 G.M. Dimitrov Blvd., Sofia. 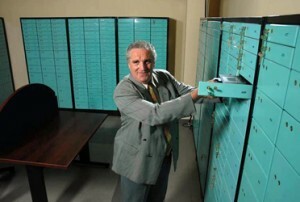 For the purposes of safe-keeping of money, jewelry and valuables, the vault offers a wide range of safe deposit boxes meeting all client requirements. The subscribers to the SOT 161 centralized security system use 20% discount from fees. The business hours of the vault are from 9:00 to 17:00 on weekdays. For detailed information please call: +359 2 817 0295 and +359 2 919 8295. The Depository Cabinet is a service provided by SOT EOOD which is directed mainly towards corporate clients generating working capital in their points of sale, such as drugstores, supermarkets, gas stations, and bank branches, i.e. representatives of the small and medium-size business. 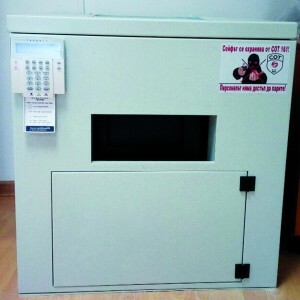 The Depository Cabinet service is unique in its design and implementation; no other company in the Bulgarian market offers a product with the same features and functionality such as the Depository Cabinet. In the security systems market, there is no other similar device providing continuous guarding of the cash-in-transit even when valuables/cash are stored in it. A minimized model has been developed and is already available. It is suitable for use in sites with limited room in the cash post.